In 1963, Poetry Northwest, of the University of Washington, Seattle, began sponsoring a Theodore Roethke Prize for poetry. This was followed up the next year with a Roethke Memorial Poetry Reading, in order to "preserve the university as a poetry center." 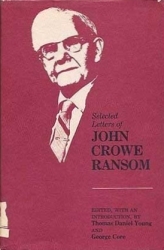 The first of these readings, in 1964, was given by John Crowe Ransom. So, Henry Reed had a small role in bringing Ransom, a fellow "major minor poet," to the first annual Roethke Memorial Reading (read Ransom's "Piazza Piece," and more). Carolyn Kizer had studied Creative Writing with Roethke in 1959, and was an editor of Poetry Northwest in 1964. William H. Matchett, we recall, had some nice things to say about Reed in Remembering Elizabeth Bishop. The University of Washington diligently provides a list of previous Roethke Readers. This past May, the reader was Paul Muldoon.